Following a November fire in a garage involving a Tesla Model S plugged into a wall charger, Tesla today said they will send out new wall charger adapters to their customers. In the aftermath of the house fire in Irvine, California in which a garage caught fire when a Model S was plugged into its 240 volt wall charger, Tesla and fire department officials disagreed on the cause of the blaze. Tesla said the fire wasn't caused by the car or its charging system, but the fire department blamed an electrical failure in the charging system. 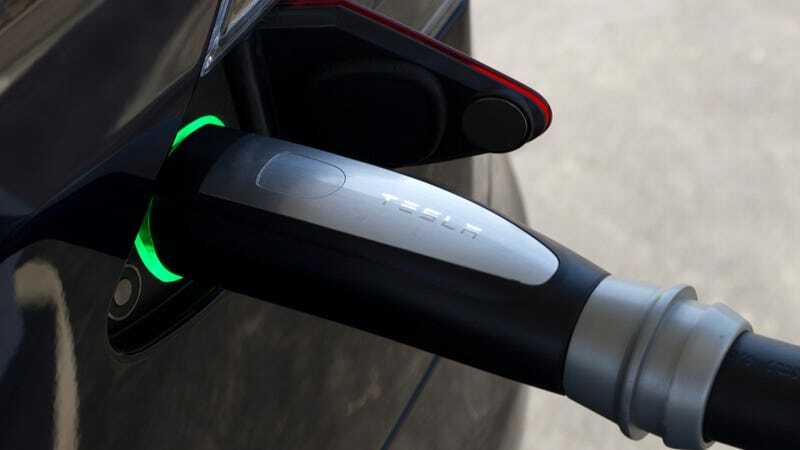 Nevertheless, Tesla CEO Elon Musk said in an interview with Bloomberg today that new wall charger adapters, which connect Tesla-issued cables to wall outlets, will be mailed to customers in the coming weeks. Bloomberg also says that based on posts in the Tesla Motors Club forums, "at least six overheating incidents" were reported last year. "In December 2013, Tesla provided an over-the-air software update that addressed potential overheating at the socket and would even protect a customer if there was bad wiring on the house side. We believe this fully addresses the problem. However, to provide additional protection for Model S customers, we have designed a new wall adapter with a thermal fuse. This upgraded adapter will be provided to all existing and new customers starting in a few weeks." Hopefully, that's one less source of fires that Musk and Co. will have to worry about.